I got a raise at work recently and to celebrate I replaced my Mazda 323 GTX’s old, rubbery factory shift knob with something a little more race-inspired. It’s a 7-inch Delrin “Competition” knob from TWM Performance. Delrin is lightweight (the whole knob is 160 grams) and it won’t be freezing cold to the touch in winter. Its length makes for a nearly 4-inch increase in height over the factory knob. I learned earlier this year that I like shift knobs close to the steering wheel after I installed an extended, angled short shifter in my Miata. The Miata is in first gear here. The combination of short shifter + extended shifter results in throws slightly shorter than stock, with the knob ~4" closer to the steering wheel. After driving the GTX for a bit with the new shift “rod” in place, I very much like the ergonomics of having it closer to the steering wheel. Previously the knob was down level with your thighs and, depending on your body and seat positioning, shifting into fifth required you to move your torso over a bit or at the least reach the limit of your arm’s extension. 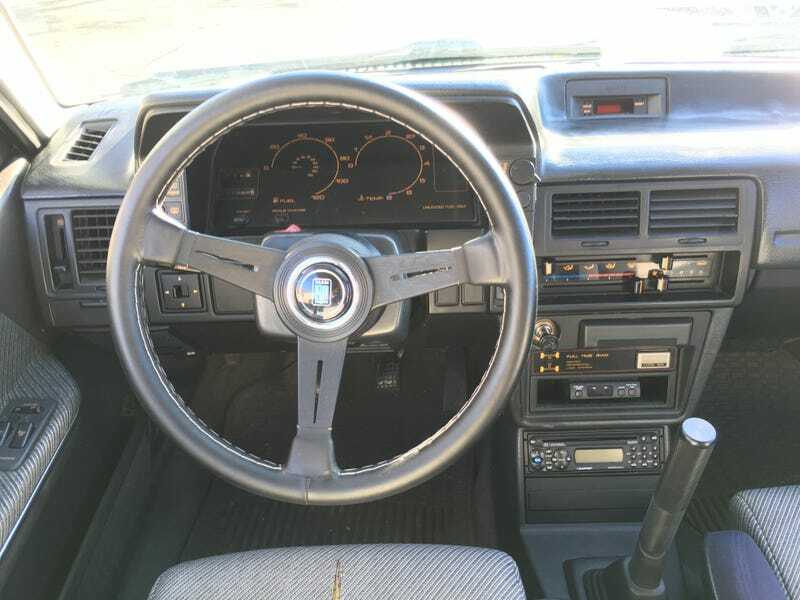 Stock shifter, stock steering wheel (with cover), stock floor mats (with stains). Now, the top of the shift rod is well above your elbow. The shift throws really aren’t too bad; the revs can take a little while to fall in the GTX. I may end up fabricating a short shifter for the car, but it’s fine for now. Gates seem to be a little trickier to find, particularly on startup, but that’s endemic to this transmission and I’m used to it at this point. The improvement in ergonomics and aesthetics make this a successful mod in my judgment. It’s even easier to pretend I’m driving a rally car now. The shift rod’s diameter matches the shift boot’s pretty darn well!